As Jess and Todd are returning home, they are on a dark and untraveled road. It is a cold, snowy, icy night; the car tumbles down a cliff and becomes wedged between two trees. The rest of the story is spent in the freezing car with them. Together they talk about how they met, fell in love, lived their lives so far, and their dreams and hopes for the future. Todd’s leg is hurt and he is in great pain. Jess must be the one to leave the car and try to find a way to survive. As the days pass, their spirits fall and they lovingly say their goodbyes to each other, knowing they have little time and hope of lasting another day. As each moment passes and they get closer and closer to their deaths, all they have left and could hope for was the miracle of being rescued. 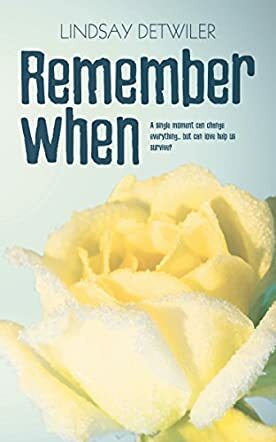 Remember When by Lindsay Detwiler is like no book I have read before. It pulled at every single emotion possible. I felt as though I was in the back seat and even though I was in a 95 degree heat wave, I was cold and scared. I could not help but think ‘what if’ my husband and I were in the car; what would our memories be; what would we be saying to each other after over 40 years of marriage? Lindsay Detwiler is a brilliant author who has written a book that cannot help but speak to each and every reader. This is a must-read that will have you crying, laughing and unable to stop reading.